It’s a big day for Slack. Today, the enterprise messaging app ticked off an item that’s long been top of users’ wishlists and announced new integrations with Office 365. Let’s start with the former first, as (speaking personally) it’s the most exciting. Essentially, Slack now lets you preview documents within the app, thereby removing the need to open them externally. From today, if someone drops a Word, Powerpoint, or Excel document in a chat window, Slack will render the first page. Clicking on it will allow you to scroll through the document without having to download it to your device. This has been a huge bugbear for me in the past, and I’m sure I’m not alone in saying that. My hard drive is littered with files that I’ve downloaded, just because I wanted a single piece of information from them. Plus, Word is a bit of a dog, performance wise. It often takes a while to open. That’s especially true if your workplace’s IT department has seen fit to issue you a wheezy “beige box” computer fished from the back of the closet. Files preview has been gradually rolling out over the past few weeks. There’s a good chance you might already have this functionality. For everyone else, it’s not that far away. I wanted to know if Slack had any plans to introduce the ability to edit documents from within the app. It’s not as outlandish as it sounds. Slack, thanks to its ecosystem of third-party integrations, can perform really complicated tasks, like creating and updating tickets in Atlassian’s Jira, or managing tasks within Asana. Why shouldn’t users be able to perform basic editing tasks? Brian Elliott, General Manager of Platform for Slack, isn’t entirely convinced by that. Speaking to TNW, he stressed that such a change could radically change the value proposition of Slack, would be technologically challenging, and would offer an inferior experience to native tools. One thing Slack has consistently gotten right is its integrations with Google Drive, Google Docs, and the rest of Google’s productivity tools. It’s obscenely easy to connect a workspace with, for example, a shared folder or calendar. At first, that made sense for Slack, as it was aimed predominantly towards early-adopter startups who aren’t so tightly wed to Microsoft’s ecosystem. But now, Slack is all grown up. It’s looking to IPO later this year and is increasingly prevalent in the enterprise world. It’s also facing stiff competition from Microsoft Teams, which is growing at a breakneck pace. 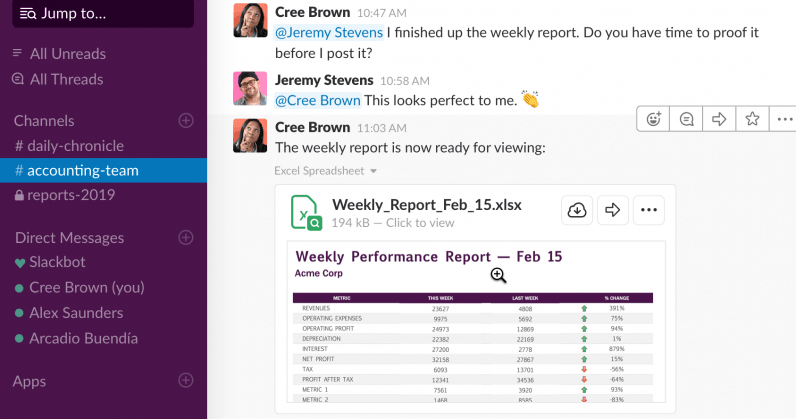 It’s therefore no surprise that Slack’s decided to embrace Office 365. Much of the attention this time round has been focused on Outlook. Slack users can synchronize their status between apps, ensuring that if they’re in a meeting or on vacation, it shows across both products. Another handy feature is the ability to answer calendar invites within Slack. This removes the need to switch between applications as much, and adds an extra layer of visibility, ensuring that important invitations aren’t missed. Users can also join scheduled Skype calls from within Slack, for those unlucky enough to have to use Skype for Business. One thing the press release wasn’t clear on: does Slack automatically convert lonesome instances of “J” into the appropriate smiley face? If you’re not sure what I’m on about, all your friends use Gmail and you should probably click here. Another handy feature is the ability to view send entire email chains to Slack with the press of a single button. This could save users the effort of forwarding threads between colleagues or having to switch between Slack and Outlook. There’s also the newfound ability to share, import and find OneDrive files from within Slack. I asked Elliott why it took so long to add this functionality. After all, Office 365 isn’t a small-fry application. It’s used by millions of people. He attributed it to managing user demand with Slack’s limited development resources. As the company has grown, it’s had to make hard decisions about where it allocates developer time and effort. The good news is that there are more useful plugins on the way. According to Elliott, there’s “thousands” currently being developed both in-house and externally. Over the past year or two, Slack has heavily invested in its developer experience. Tools like BlockKit, for example, make it easier to build consistent Slack user experiences. As this barrier to entry lowers, we can expect to see a flood of new tools, making Slack a more enticing proposition for both startups and enterprise customers.